deliverables. Levels of quality are defined and measured. helpdesk and technical support and others. centres that remain in-house are in the context of offshoring particularly referred to as `captives'. The customer is the party talking to a call centre agent. and factors are used inter-changeably in this research report. a brief discussion of this matter clarifies the relevance of this research report. sourcing nation in Europe is accounting for around 14 percent (Pritchard, 2011). are reported to be India and the Philippines (A.T. Kearney, 2011: 13). firms' competitiveness and satisfy business motivations. therefore invest and set up offshore operations to meet the market demand for offshore services. operations portfolios" (AvantiCall website, no date). serve the global English speaking market (Mawson, 2011). of India and the Philippines where global firms started operations and created thousands of jobs. offshore sourcing of UK call centre services. unfavourable and expensive labour law regulations. countries, predominately resulting in cost advantages based on lower wages. compare or quantitatively measure South Africa's attractiveness as such or against other locations. population is found in their broad experience and expertise gained on a local and a global level. They have a good understanding of UK firms' motivations and views on offshoring to South Africa. driver for its very creation. industry developed in recent years? 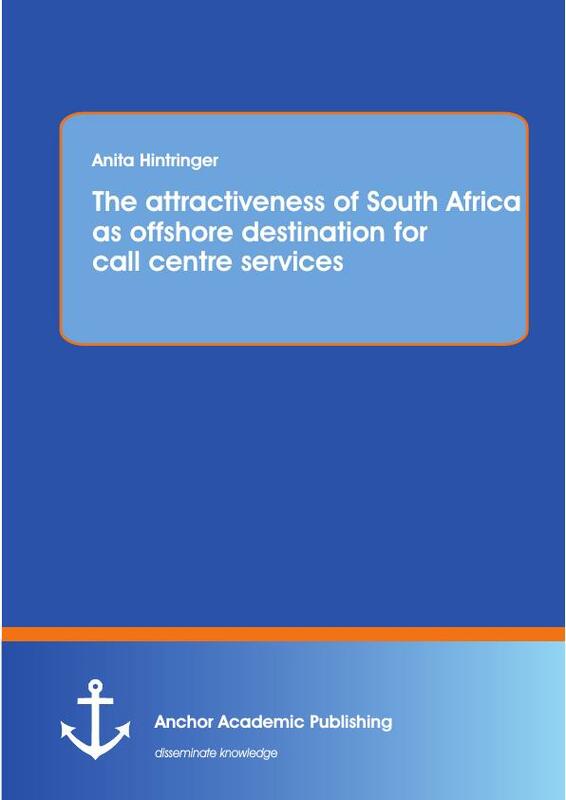 The UK client market: what are UK firms' motivations to offshore call centres to South Africa? what offshore locations are relevant to the UK and can further offshore growth be expected? what possible recommendations can be made? number of operators have established themselves and valuable experience can now be accessed. strengthen the future of the South African offshore industry. potential to make South Africa more attractive for firms that are not yet operating in South Africa. establishing of such is beyond the scope of this research report. attractiveness as offshore location but the study does not investigate specifically in this direction. allow for facts like the respective relevance of foreign languages from a UK perspective to surface. call centre medium and no specific consideration is given to the written medium. studies, research papers and the World Wide Web. complex and dynamic nature (Doh, 2005: 695). South African government with the focus on job creation relevant for policy formulation (e.g. like A.T. Kearney (2011) cover a wide range of destinations and present only high level views. collection of fundamental and rather recent research findings on offshoring. dedicated to the subject (Duke CIBER, 2008). approach must be taken when using information and data provided by such stakeholders. seen as a marketing vehicle intended to attract foreign investment. will be asked to rate South Africa's attractiveness. introduced. This chapter concludes with a summary on the literature research findings. explains the approach taken to gathering and analysing primary data. will be made that lead to further research needs. are received and consumed in the host or client country. (Holman, Batt & Holtgrewe, 2007: 4; Chakrabarty, 2006: 26). roaming the globe in search of locations that provide them with cost reduction potentials. compared to the younger trend of offshoring of business processes and services (Srivastava & Theodore, 2006: 22). processing are term contact centres (Grazebrook, 2011: 12ff; Srivastava & Theodore, 2006: 23). specialised in nearshoring (e.g. Canada, Ireland) and offshoring (e.g. India). Source: Holman et al., 2007: 5.
are serving the firm's own customers, and the remaining one third is managed by third parties. level the largest user of call centres services (Frost & Sullivan, 2009: 3; Holman et al., 2007: 4ff). This emerging offshore call centre industry is a complex and rapidly changing landscape. substantially over coming years because of advantages in terms of price, scalability and quality. (taking into consideration the currently experienced global economic slowdown). firms to offshore non-core services (Tate et al., 2009: 515). be positioned favourably in the minds of firms as competitive pressure applies. that if the external offshore market is more efficient, offshoring will follow (Tate et al., 2009: 514). expensive offshore (DTI, 2004: 6). locations therefore offering further potential to reduce the cost of delivering the service. aligned with the risk profile of a firm. increased labour demand or political and social factors may change. (A.T. Kearney, 2009: 1; Larsen, Manning, & Pedersen, 2011: 3). therefore reducing recruitment and training needs. India with a very large consumer market (Tate et al., 2009: 514ff). asserted focus on cost and therefore labour cost savings over other possible motivations. The term outsourcing, like offshoring, falls into the wider arena of sourcing strategies of firms. an in-house vendor (=captive) or from an external vendor (=outsourcers) (Chakrabarty, 2006: 26). Outsourcing of business processes and services has been a growing phenomenon for many years. activities to external providers (Greaver II, 1999: 3ff). deliver the same or better at reduced cost (Greaver II, 1999: 4f). structured document that allows the client firm to compare offers (Greaver II, 1999: 5). of a call centre to a far away country, the opportunity to reduce their cost base significantly. advantages (Everest Research Institute, 2010: 2ff). the service with employees of a different culture and background. be the fastest growing segments in particular for call centre outsourcing. channel set up to deliver on consumer experience is a current key driver for the industry. any other country (Grazebrook, 2011: 12). and instant messaging as well as continuous multi-tasking capability (Grazebrook, 2011: 12). some form of an evaluation process. (e.g. workforce) to do something else that produces higher value (Fletcher, 2010: 3). government policy (Smit, 2010: 105ff). health care, factors affecting the quality to live and work) (Porter, 1990: 71). Demand conditions look at the domestic consumer demand for the output of a domestic industry. which an offshore firm can tap into. technology, telephony systems, transport and real estate. industry and to raise awareness through marketing initiatives. business or bring about reforms. with little home market demand and little relevant sophistication. outweigh positive attractive factors which reduce a firm's competitiveness. and publishing guidelines derived from own research, experience and expertise. is specific to offshore sourcing and uses business relevant terms when clustering country metrics. their relevance for location decision making. will form part of the primary research when the attractiveness of South Africa will be evaluated.